Otzi the Iceman: Early evidence of acupuncture. Discovered in the Alps in 1991, Otzi the Iceman had been frozen for over 5300 years, perfectly preserving his body and telling us how he lived and how he died. For instance, we know he had intestinal pain from whipworm and arthritic pain from Lyme Disease in his low back, hip, knees, and ankles. And we know he had 61 tattoos. Here is the interesting part: Most of his tattoos are over known acupuncture points–ones that today we would use to treat the intestinal and arthritic pain Otzi experienced. Otzi is not the only example. A 1000 year old woman from Peru has neck tattoos corresponding to acupuncture points for neck pain. A 4000 year old Egyptian mummy has tattoos that follow the known energetic meridians in the body. 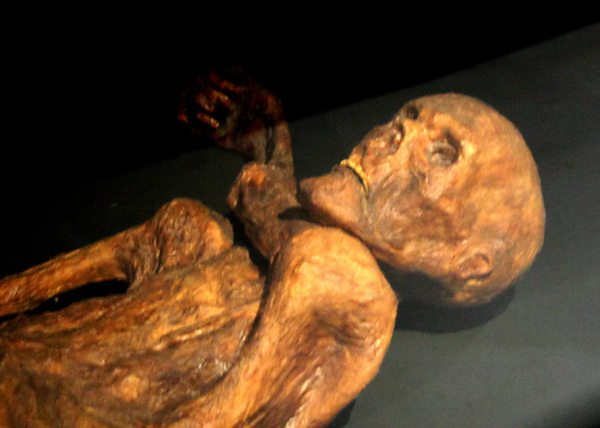 Mummies from all over the globe–Egypt, Siberia, the Americas, China, as well as many other areas–have tattoos. If examined would they, too, reveal more evidence of ancient acupuncture, evidence we have not yet discovered? And if diseases, tattoos, and acupuncture points in these mummies correspond to the extent that they do for Otzi, then was acupuncture once a global skill and possibly evidence of our Lost History? There is a YouTube for that: Conventional information on the Iceman. Information from: Marsolek, Patrick. (2012). Acupuncture and the Iceman: How Could a 4000 Year Old Body Show Signs of Advanced Therapy? Atlantis Rising, 94, (p. 25, 60-62). Seriously, Lyme Disease was around 5300 years ago…who knew? Yikes.